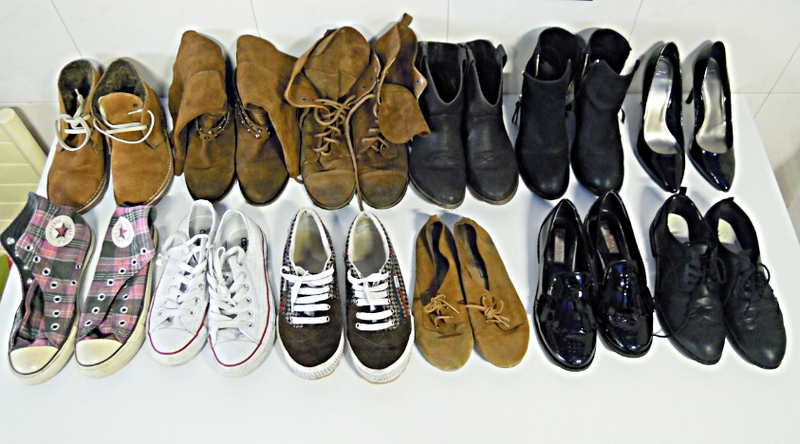 Brown with sheepskin/ BIT, brown with studs/ Pull and Bear, brown with laces/ Pull and Bear, dark brown/ Stradivarius, black with zips/ Topshop, black heels/ H&M, brown with laces/ Zara, pink sneakers/ Converse, white sneakers/ Converse, brown sneakers/ El Ganso, black loafers/ Zara, black Oxfords H&M. Some day I'll show you the whole colection. Got yourself a favorite? those pull and bear are my favorite!! love this post and also your blog! It's so nice!!! I follow you! love the Topshop ones!Thanks a lot for your comment!I follow you too! thank u a lot for the comment o my blog! I love the pull and bear with laces and black loafers! great collection of shoes! Well can you send your brown boots with studs? :P Great shoes you have! So many shoes you have :) like them..
a mí me gusta los cinco primeros de la primera fila, los converse blancos y los marrones al lado. me encantan tus playeras del ganso! y me encantas tú! I love every pair of shoes in the picture!! I love your blog, following now! Check mine if you like.